Natural Disaster is the common phenomena in Bangladesh especially in the Cox’s Bazar since it is a coastal area. Every year people of this area face different types of natural disaster like cyclone, sudden flood, flood, earthquake, fire incident etc. Natural disasters cannot be prevented, but the disaster risk can be reduced by enhancing capacities of the community people on the disaster preparedness and risk management which lead in reducing vulnerabilities and damages during the disaster. So YPSA and HOPE’87 Bangladesh provide Disaster Risk Reduction training to school students for strengthening school-based disaster risk reduction approaches in Cox’s Bazar under the project Youth Empowerment through Skills (YES Centre) with the support of ESPRIT and in collaboration with YOU Foundation. 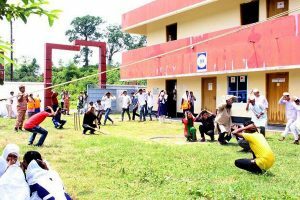 As a part of this training YPSA has arranged a disaster simulation session in YES centre, Ramu, Cox’s Bazar on 19th April 2017. 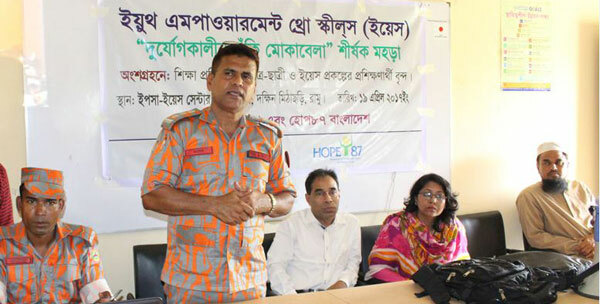 Fire service and Civil Defense, Cox’s Bazar has conducted the simulation under leadership of Mr. Abdul Malek, Deputy Assistant Director of Fire service and civil defense, Cox’s Bazar. Around 150 students from different schools, Madrasa who received DRR training and trainees of YES center, Cox’s Bazar has participated in the simulation. 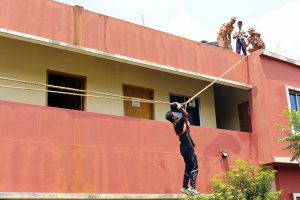 Through the simulation session participants gained the practical knowledge on how they protect themselves and rescue others during and after disaster. After the simulation session a briefing session also conducted where Mr. Abdul Malek, Deputy Assistant Director explained the role of the students and community for reducing disaster risk. Mr. Mahabubur Rahman, Director (Social Development Program) of YPSA has presided the briefing session. Besides Ms. Nasim Banu, Focal person of YES project, journalist, school teachers, guardians and community people also present in the simulation. Mr. A. K.M Manirul Haq, Project Manager of YES project has coordinated the simulation program.